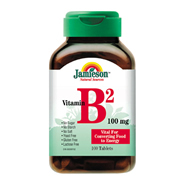 Vitamin B2 is essential in tissue respiration and for the utilization of energy from food. Necessary for good vision and skin. Each tablet contains: Vitamin B2 (Riboflavin) 100mg.